Now, I don’t know if I would call the influence of the berries all that pungent. There’s certainly a level of tartness present, but it’s certainly not over-powering. And much like several of the recent releases in this series, Kvasir has a character not at all dissimilar with a gruit. Perhaps that’s due to the nature of the “ancient” ingredients each of the beers in this line of releases if crafted with. Kvasir pours a brilliant golden amber in color with a small head of off-white foam that fell slowly to a light surface cover. 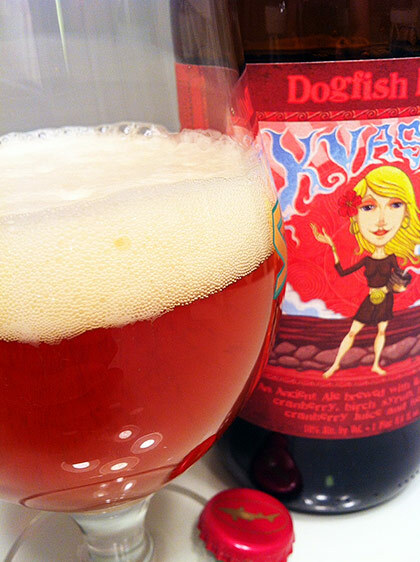 The beer smells herbal and floral with hints of berries, honey, ginger and cranberry juice. There’s a measure of tartness that tingles the nose and causes the mouth to salivate in preparation. The initial impression I got form Kvasir is that it was very similar to a gruit, but with pronoucced fruit presence and tartness. The tartness is of a moderate level in nature and lingers nicely in the warming and lasting finish. I do pick up the honey and cranberry, but not sure much else stands out from the crowd  maybe some ginger as it warms. I liked Kvasir. While it carries a similar overall character to other recent Ancient Ales  primarily the gruit traits &#151 it is a step up from the Birra Etrusca which I though was just sort of there. The mixture of ingredients within Kvasir, however, is enough to separate it from the rest of the line in the series with a more unique flavor profile. This line of beers is always fun to explore and sample, but I’m not sure that they offer much in the way of revisitation. If I want a big beer from Dogfish Head, I’ll stick with their mighty World Wide Stout.